CMS iRecruit will be attending the 2013 SHRM Annual Conference & Exposition in Chicago June 16-19. We’re looking forward to seeing Hillary Clinton, astronaut Mark Kelley and Gabby Giffords, music from Kelly Clarkson and more. We’ll be at Booth #1927 with our partner Employee Based Systems (EBS). Stop by our booth in the Exhibition Hall in Section “A” (tell them Linzi sent you) and get a free coffee on us. 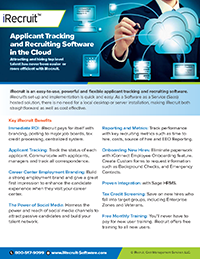 iRecruit is a hosted, web-based recruitment software designed to provide any size of business a cost effective, affordable and simple way to handle their recruiting process online. iRecruit provides you with a custom career center that will allow your applicants to select the position they are interested in, and apply online through your website! Weekly demos, Tuesdays and Thursdays at 2pm Eastern Time, or call us at 1-800-517-9099 to schedule a demo at your convenience. This entry was posted in Blog, Events, iRecruit Blog and tagged shrm. Bookmark the permalink.